The finished product! Do you like it? Just kidding! This is definitely the 'Before' shot. 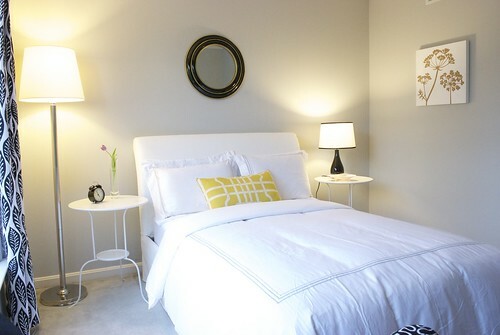 The much anticipated guest room has finally been decorated and I am SO excited to share with you it's transformation. It all went down this past Saturday with the help of my entire family. My parents were expecting out-of-town guests (all the way from Korea!) late Saturday evening, which is why there was such urgency in getting the room done asap. But I think that even if the guests hadn't been coming, I would've had this room done in the same amount of time since I was so anxious to see it finished. 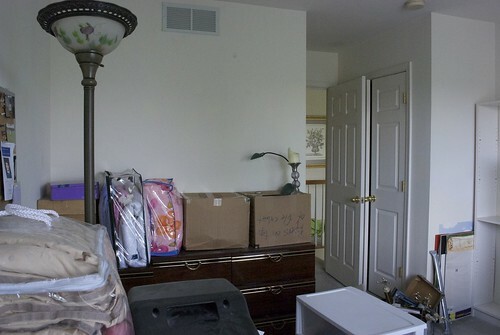 As you can see in the photo above (and a few below), the room was in dire need of a redo. It used to be my brother Tim's room when we were all living together, but over time it had basically become a storage room for his old stuff. 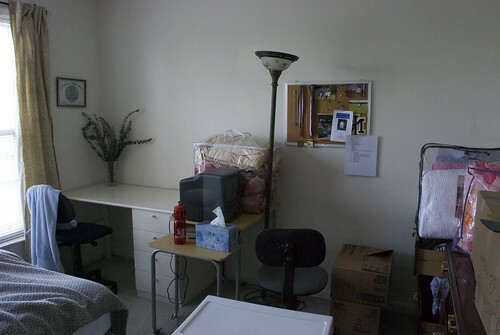 The room had never been painted until a few weeks ago, but everything else (furniture, rug, drapes, lighting, etc.) was added this past Saturday. Check out the 'Before' shots! The two things we kept before re-decorating were the black & gold dresser and the mattress. Everything else had to go! 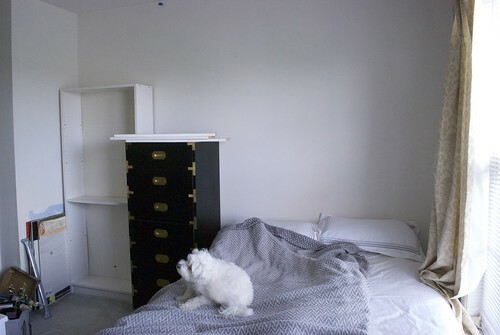 So glad to get rid of that hideous 1990s lacquered faux wood dresser. 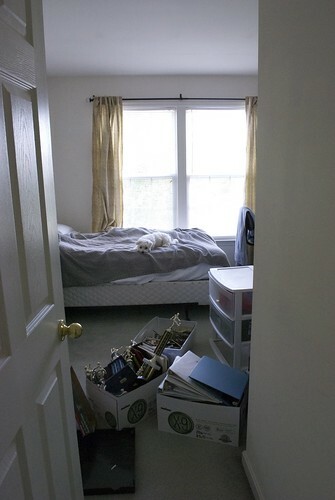 Just removing everything from the room made a huge difference. Changed the orientation of the bed to better utilize the space, since it was originally blocking the window. Got hotel-inspired bedding, which was visually simple but elegant. Added a yellow, patterned rug to break up the gray walls and carpet. The silhouette of the side tables are light and leggy which keeps the space feeling airy and spacious. Added hints of gold, since I love how glam it makes the room feel. 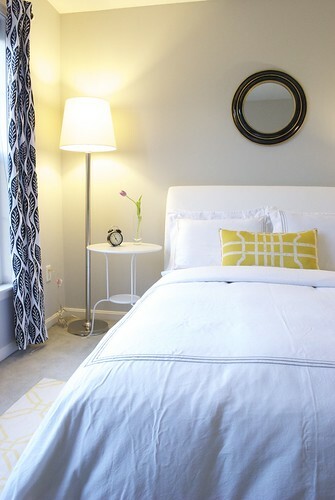 The patterned drapes, along with the rug, were a nod to the modern vibe that I wanted to add. And since I kept it simple with other aspects of the room, I was able to go a little crazy with the drapes. 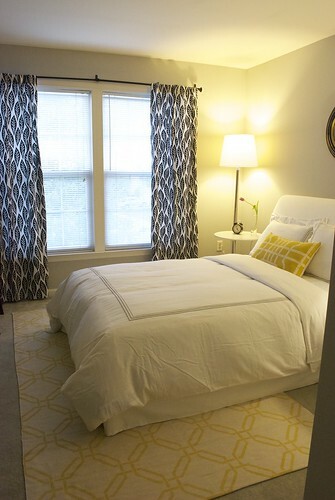 The yellow geometric pattern rug really lightens the floor up and adds a fun, modern flavor to the room. I thought the black Crate & Barrel desk, which had been sitting in our garage since I first re-did our office, would be perfect in this room. Sammy and Emma hamming it up for the camera as usual. 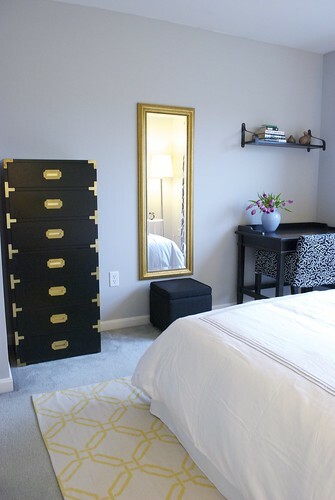 The gold mirror is a standout against the black dresser and black desk. Plus, it creates more light in the room, since it's reflecting light from the window. Somehow I managed to dress myself that day to match the room but it was on accident. I swear! I absolutely LOVE this room and am so happy with the way it turned out. And the best part about the room is that I spent less than $1000 for everything! With the exception of the black & gold dresser, black desk, and mattress, that's all my parents spent. What do you guys think? Could you have a room like this in your house? 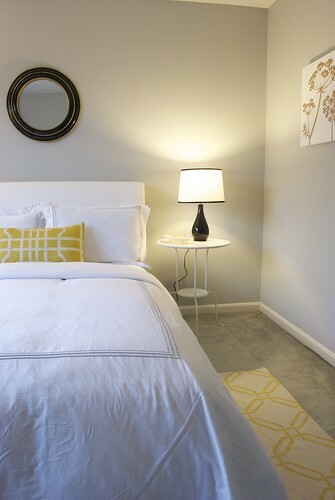 Yellow rug, Upholstered bed, White side tables, Black & White upholstered desk chair, Black lamp base, White w/ black trim lamp shade, Window panels, Wall Shelf, Wall Brackets, Gold mirror, and Bed-side table clock. 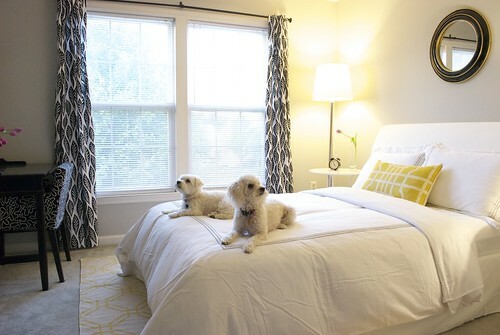 Yellow throw pillow, Home Goods; Black & Gold mirror, Home Goods; Floor lamp, Target but only available in stores; Tall bed-side table vase, Home Goods; Black storage cube ottoman, Target; Duvet cover + pillows, Home Goods. 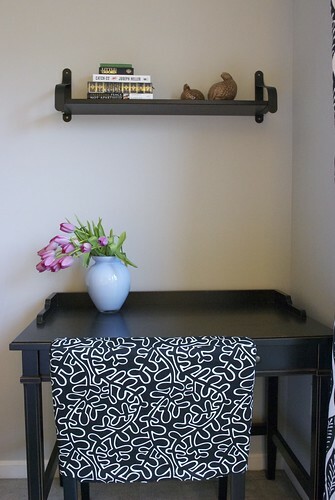 Black Crate & Barrel desk, black curtain rod and brackets, blue vase, and black & gold Hollywood Regency style dresser. wonderful job on the room! It really does look like a modern hotel room. I wouldn't mind being a guest here one bit! @LW - Thank you darling! Yes, they both love it and they want me to re-do other parts of the house, which I am more than happy to do :) So get ready for more posts about it, haha. I know you said modern a few times, but it also appears very relaxing. Has the crisp feel of a hotel, but without being cold or used. I'd love to stay in this room if I was visiting friends or fam. Beautiful!